My Anglo-Indian novel Sculpting the Elephant will be published on March 1. One part of my brain has to stay in the subcontinent so that I can talk about Ramma and Harry and Bartholomew Carew uncovering the lost history of Buddhist India under Ashoka. At the same time, the creative part of my brain is in London and Kenya. Uniquely, this third novel is a collaboration. 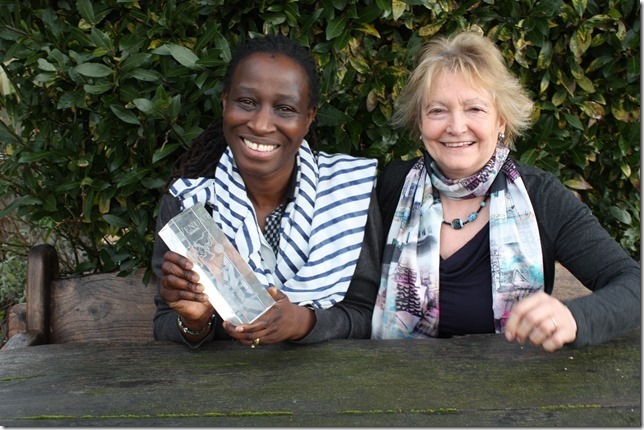 I’m writing it with my Kenyan friend – the incredible Nancy Hunt. Not many women can claim to be ‘most inspirational’ but Nancy has the trophy to prove it!I have worked on non-fiction and screen play collaborations but FICTION? Does anyone know of any novels written by two people? I sent the first 40 pages to an exceptionally well-read friend who could be relied upon to tell me the truth. ‘Does it read like it is written by 2 people?’I asked. His answer was emphatically ‘NO’. He loved its energy and the subject matter. I love the stimulation of tossing around ideas in the knowledge that the background detail will be absolutely authentic .